In the past decade, the percentage of children placed in congregate care settings has significantly decreased at a greater rate than the overall foster care. This trend reflects a growing consensus within the child welfare field that restrictive institutional settings for foster children should be used sparingly, for short periods of time, and only when necessary. With varying success, most states have made efforts to move in that direction and many have seen significant reductions in the number of children in congregate care settings, including New Jersey, Maryland, Maine, Louisiana, and Virginia. In Oregon, Kansas and Maine, the percentage of foster children in congregate care is now as low as 4 to 5 percent. Several states with above-average percentages of foster children in congregate care are now striving to reduce those numbers. 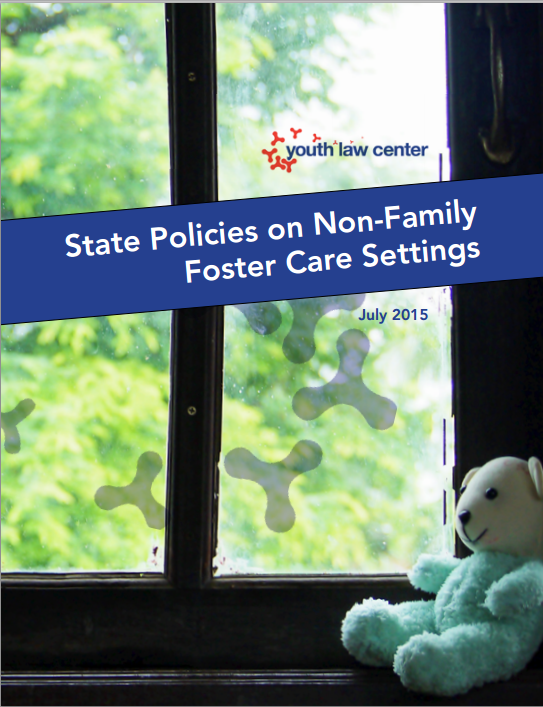 The Youth Law Center, a SPARC state partner, recently reviewed state policies that restrict congregate care use for children and youth in the foster care system in a paper titled “State Policies on Non-Family Foster Care Settings.” Among the findings, the most common restrictions on congregate care that states employ are based on the age of the child, most often for children under the age of 6, although some states limit congregate care placement for older children and others impose restrictions on use regardless of age. Some restrictions apply to specific facilities, such as distinguishing residential treatment centers from other types of group care. The Youth Law Center report also provides a number of recommendations including eliminating congregate care as a placement and permitting residential treatment as an intervention only if it is the least restrictive option to meet the child’s documented clinical needs. Read more of their recommendations here. While these trends suggest that child welfare practice is moving toward more limited use of congregate care, practice is still not consistent across states and more work remains to be done. 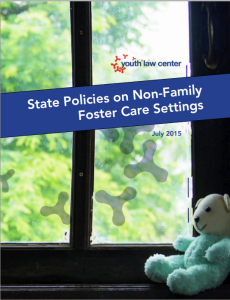 Several states, including West Virginia, Rhode Island and Colorado, still house more than 25 percent of their foster care populations in group homes. Shifting away from a reliance on group homes also makes fiscal sense for states, as monthly costs of congregate care can be 6-10 times higher than foster care and 2-3 times higher than treatment foster care. Youth entering group homes often present with multiple complex needs and exhibit behavioral problems. In a nationally representative sample of youth in care, 55 percent of youth in group care scored in the clinical range of the Child Behavior Checklist delinquency subscale, compared to 48 in non-kin foster care. For youth entering group care, rates of conduct disorder or oppositional defiant disorder diagnoses have also been reported to be as high as 75 percent – which is significantly higher than the rate reported for youth in foster family settings. While youth placed in group home settings often exhibit behavioral problems, many could benefit from therapeutic mental health services provided in less restrictive community-based settings rather than group care. In practice, children are often placed in group homes because an appropriate foster family or kinship caregiver cannot be found, home-based therapeutic services are not maximized, or in some cases result from inadequate placement and utilization review processes. In fact, according to a recently published Kids Count policy report, one in seven children in the child welfare system is placed in a group setting even though more than 40 percent of these children have no documented clinical or behavioral need for placement outside a family setting. This practice is especially concerning. States used a range of strategies to reduce congregate care, including expanding services, developing alternative placements and revising how they used congregate care. Lack of appropriate assessments of a child or youth’s mental and physical health needs that can help in identifying the treatments or services that are needed. As one stakeholder noted, many communities lack a holistic support system, including access to behavioral and mental health services; crisis support; housing; and education – all of which could help facilitate the use of family-like settings as alternatives to congregate care. Part of the challenge is that Title IV-E funds are typically not available for such services for children and families outside of the foster care system. That might soon change. Legislation is currently being drafted in the Senate Finance Committee that would enhance federal funding available under Title IV-E to provide for prevention and family services to help keep children safe and supported at home with their parents or other family members, gives states and tribes the flexibility to adapt evidence-based family services to the specific needs of each family, and ensure that states and tribes are held accountable for allocating services in ways that maximize safety, permanency, and well-being for children, while minimizing the prevalence of lengthy foster care placements. The bill would include key provisions of the Family Stability and Kinship Care Act introduced by Senator Ron Wyden and Representative Lloyd Doggett. Given current child welfare financing constraints, the Family Stability and Kinship Care Act is a “game changer,” offering a critically important new funding source to support states in their efforts to provide a broad array of effective services to vulnerable children and families. It does this by extending Title IV-E funding for time-limited family services for children identified as candidates for foster care or who are in foster care, without regard for the Title IV-E income eligibility requirement. The bill also increases funding for Title IV-B, Part 2 which although a relatively small funding stream compared to the open-ended entitlement for foster care under SSA Title IV- E – is nevertheless critical for the work of State social service agencies given that it may be used to provide services to children and families in need and helps keep families together. The finance committee’s proposal will also include a provision(s) to reduce reliance on congregate care where appropriate and ensure that states demonstrate efforts to see to it that children are not unnecessarily placed in restrictive settings but rather, in the care of families whenever possible. We hope that the finance committee also recognizes the need to support states’ in building their capacity to respond effectively to the behavioral health needs of children and families in home and community-based settings. In reality, a number of effective therapeutic alternatives to group homes including Therapeutic Foster Care, Cognitive-behavioral, family systems and motivational enhancement therapies, Multisystemic therapy, multidimensional treatment foster care, and Functional Family Therapy are all designed to effectively treat youth within community-based settings. Yet the reality is that the availability of such effective home and community-based interventions is limited and states are struggling to increase capacity to offer such services to children and youth in care. We hope the finance committee will consider including a provision that would response to this need. A great model is a demonstration program outlined in the Administration’s federal fiscal year 2016 budget which would allocate $750 million to improve federal and state efforts to curb overmedication of children in foster care. As part of the initiative, the Centers for Medicare and Medicaid Services would allocate $500 million as incentives to states that demonstrate reductions in inappropriate prescribing practices and over utilization of psychotropic medications, increased use of psychosocial treatments, and improved outcomes for foster children. These dollars would support states’ efforts to provide effective evidence- based or evidence-informed home and community-based interventions to young people in foster care, reducing the use of residential treatment and other restrictive settings for children and youth in care.